One of the first positive attributes that I feel international students bring to our classrooms is the ability to take risks. I was sent by our government to Russia as a volunteer consultant in 1996, 2000, and 2001. As I was getting ready the first time, for about 3 weeks in Moscow and then Novosibirsk, I was apprehensive, maybe a little worried. And, I was about twice the age of the international students who come great distances to study a semester or an entire academic career at Castleton! I respect all international students for their courage to try something and some place new. I love seeing how the international students that are in my classes “grow” as they are here. Sometimes that growth is with their English, other times it can be at learning our culture, but it has always been a positive growth. Finally, I find the international students to be well prepared with their academics when they arrive. I look forward to contacting one of them (Elnura Alinova) who was here in the fall semester. She has agreed to serve as a “correspondent” from her home and her school, sharing with me and with my BUS 3245 Global Marketing class such information as what American products she sees at home, what she feels we could trade with businesses in her country, how our school differs from hers at home, and how we can learn from the people in her country. 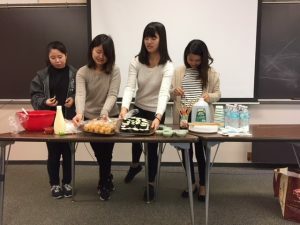 Thank you, international students, for sharing with us! I had a great college experience. I had great professors, competed on the varsity alpine ski team, and was involved with student government. Most importantly, I made many life-long friendships. My college experience would not have been the same if it were not for a particular group of students. This group of students I am referring to are international students. To me, the international students brought so much to my overall college experience. Many of my college friends were international students. I thought it was so cool to hang out with students from countries like Japan, Sweden, Denmark, Brazil, Jamaica, Kenya, and Ireland. These students added so much to classroom discussions and everyday life on campus. I was able to learn so much about different cultures. I was even able to learn a few foreign words and phrases. I know that if I were to visit a particular country, chances are I will probably have a place to stay (or at least a tour guide!). In fact, I actually stayed at a bed and breakfast owned by the grandmother of an international student-friend when I traveled to Ireland after graduating from college. 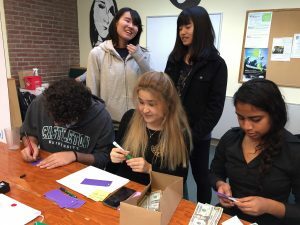 These types of experiences, connections, and lifelong friendships are things that I hope our Castleton University students will have. I love that Castleton has grown its international population! 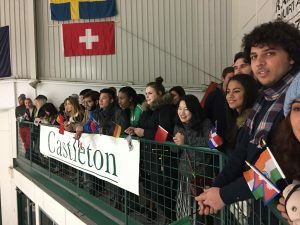 In particular, it is neat to see international students coming to Castleton to participate in varsity athletics. Currently, the men’s and women’s alpine ski teams (which I coach), men’s soccer, men’s basketball, men’s tennis, and men’s and women’s ice hockey teams all have rosters that include international student-athletes. 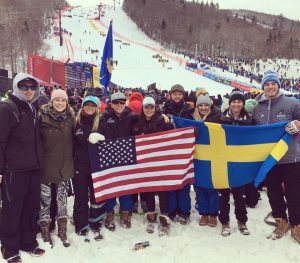 Currently, the men’s alpine ski team has two international student-athletes from Sweden and Croatia on the roster, while the women’s team has one skier from Sweden. The incoming class for the fall of 2017 includes one male from Austria and two from Sweden. The women will be adding one more Swede. However, we may not be done, as we are waiting on decisions from four other international skiers. 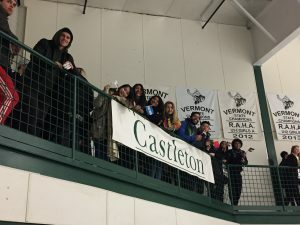 When I started coaching the men’s and women’s alpine ski teams at Castleton University in August of 2003, one of the first things I noticed was that there was a lack of international flavor on campus. I felt as if our students were missing out on something special. The men’s and women’s ice hockey teams had some Canadian student-athletes, so that was a start. However, I felt as if we needed more. I was determined to recruit some international student-athletes for the men’s and women’s alpine ski teams and give our domestic students the type of international exposure that I had when I was in college. Ski racing is a popular sport in European countries like Austria, Germany, Sweden, Norway, Italy, etc., so naturally, there are some very good ski racers abroad. This alone, should be enough of a reason for a coach to want to recruit international ski racers, but there are plenty of very good ski racers in the United States. A focus in trying to attract international ski racers is to bring something else to the team. I want the American student-athletes on the alpine ski team to have the same experiences I had. Sure, having the international talent is a big plus and helps us win races, but there is more. They bring depth and cultural diversity that enhances the learning environment of every student-athlete. So far, my vision is coming true. Our current international student-athletes have been a major asset to the success of our men’s and women’s alpine ski teams. In addition, I am seeing many positives off the slopes, as they add to the learning environment in and out of the classroom. I have seen relationships built between international students and American students that will last a lifetime. It makes me so happy to see our American student-athletes taking international student-athletes home during breaks. It has also been cool to see our American student-athletes visiting our international student-athletes. Last summer, two of our American student-athletes visited two international student-athletes in their home country of Sweden! Those two American students may not have had the chance to visit Sweden (or even considered it!) if it had not been for that connection. My hope is that this continues as we grow our international population. Not just with student-athletes, but for the campus community as a whole. 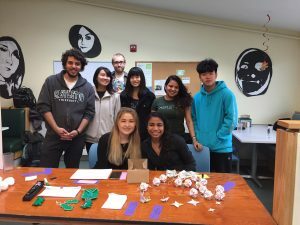 Sitting alongside and learning from international students in the classroom, various social settings, or even on a chairlift ride at Killington Ski Resort is part of my college education that I hope our Castleton University students have a chance to experience. I remember the day I took over managing the international applicant territory…it was March 2008, and it felt overwhelming and exciting at the same time. Questions ran through my mind such as: How would I be able to read students’ applications? How would I understand their transcripts to know if they were admissible? How would I be able to communicate with the students when we don’t speak the same language? Thank goodness for the internet; Google Search and Google Translate became quick friends of mine! Throughout the summer before the fall 2008 semester, I became email buddies with the incoming students, learning about them and helping them prepare for their arrival and time at Castleton. That fall we welcomed four international students … all from Canada. I was so excited to finally meet the students I had been working with so closely! The spring 2009 semester we welcomed just one new international student from Canada who would join his fellow Canadians on the men’s ice hockey team. Now it was time to focus on the fall 2009 class, which turned out to be pretty impressive. We had nine students enroll from three different countries, Canada, Nigeria, and the United Kingdom. They were mostly athletes joining the men’s and women’s ice hockey, men’s basketball, and women’s ski teams. Unfortunately, we didn’t bring in any new international students for the spring 2010 semester, but that did not discourage my efforts to work towards the fall, when we brought in five students from Canada, all joining the men’s hockey team, and one student from India! The following year, 2011, was fairly quiet with one student enrolling in the spring and five in the fall. However, it was our most diverse group yet; the students came from Canada, Japan, Peru, and Zambia that year. By then I felt more comfortable in my role of working with international students through the admissions process. While I still relied on my trusty Google friends, I had started making connections with colleagues at other institutions and attending conferences to enhance my knowledge. In the fall of 2012, we brought in another exciting class including nine international students from Bermuda, Canada, Denmark, Honduras, Peru and Sweden. The spring of 2013 was another quiet semester with no new international students enrolling, however the fall was certainly a notable class. We welcomed eight new international students from Canada, Latvia, and Switzerland. 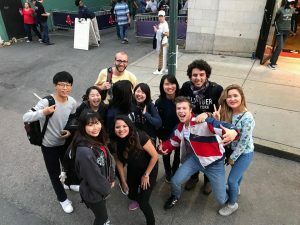 At that time I could say that I had helped welcome international students from 12 different countries, and we were really on the move with diversifying our international student body! 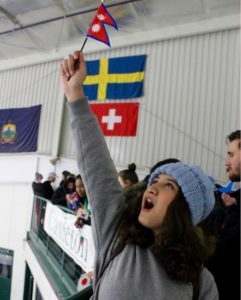 The spring semesters are always a challenging time to welcome new international students because they arrive in January during our cold, snowy, Vermont winters. I remember meeting our one new international student for the spring 2014 semester on a nice cold snowy day; he was from Pakistan and excited to start his adventure at Castleton. The year, 2014, marked a real turning point for Castleton as we started to dedicate and invest in our efforts to internationalize Castleton’s campus not only from a recruitment perspective but from a retention and support perspective as well. After some hard work and dedication during the spring and summer, we welcomed a record breaking number of new international students, 12 to be exact!!! They were from Brazil, Canada, Nigeria, Sweden, and Zimbabwe. 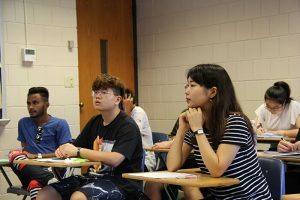 Three new international students from China, France, and Sweden joined the Castleton community in the spring 2015 semester. 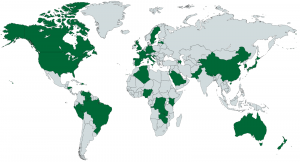 With the addition of the three students and two new countries to mark on the map, our motivation was high to work on the fall 2015 class of international students. Yet again, we broke our record and brought in 22 new international students! They hailed from Canada, China, the Czech Republic, the Democratic Republic of Congo, France, Germany, Kenya, Nigeria, South Korea, Spain, Sweden, and Switzerland. That was certainly an impressive year! With our excitement over the growth of our international student population, we were ready to take on the spring 2016 semester. We introduced three new students from Canada, France, and Germany to our beautiful campus. Our fall 2016 class was an exciting one. Not only did we welcome 21 new international students who would be enrolling as Castleton students, we also welcomed our first group of Global UGRAD students who would spend one semester with us bringing our total to 25 that fall! They came to us from Algeria, Australia, Azerbaijan, Canada, China, Croatia, Czech Republic, Denmark, Italy, Nepal, Saudi Arabia, Sweden, and Vietnam. Staying consistent with the past couple of springs, the spring 2017 semester welcomed three students, one each from China, the Dominican Republic, and Sweden. This coming fall 2017, we anticipate another strong class of international students, hopefully 25-30 new ones. We will welcome five Global UGRAD students and six students from other universities in France and Japan with whom we have built exchange programs. So far we have students who will be enrolling from Bhutan, China, France, Israel, Japan, Kyrgyzstan, Nepal, New Zealand, the Philippines, Sweden, the United Kingdom, and Venezuela. I am happy to say that during the last nine years we have welcomed more than 130 international students from 39 different countries to our campus! That is no small feat for our beloved Castleton University. My work with Castleton’s international students has been very rewarding and I have built friendships with many of them. It’s always bittersweet to see them graduate and move on to new adventures, but I know that Castleton has served them well in their time here, they will go on to do great things, and lastly share their Castleton story with the world!